Already making a name with its all-organic vodkas and Halcyon gin (which won Gin Of The Year from TheGinIsIn.com), Bluewater Distillery recently expanded into a larger venue right on the Everett marina, not only increasing the distillery footage, but also opening an attached restaurant (a rarity with distilleries) and event space. Here are three impressions from a recent visit. The Drinks: One of the nice things about having an actual bar in a distillery is being able to taste their products in actual cocktails. And here the cocktails are really well made, with a focus on freshness, a tasty simplicity, and the use of an array of housemade tinctures, syrups, and more (bartender Tyler Moore has made more than 100 and counting). A specials board has a handful of drinks, plus there’s a rotating cocktail menu of 12 more. Perhaps the top sipper when I was there was the Cedar Gimlet, with Bluewater’s Halcyon gin, lime, a cedar tincture and cedar syrup – it had that strong lime center you want when a drink carries the “Gimlet” moniker, but also layers of cedar and botanicals. 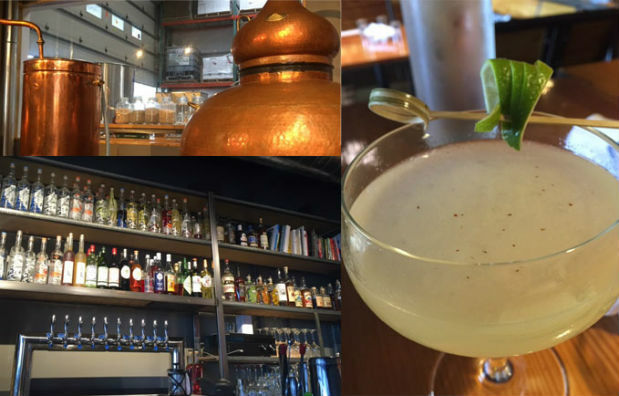 Bluewater also serves drinks with other local distiller’s products, and are willing to whip up drinks on the spot (Moore made us a wonderfully spicy new drink with a recently infused Poblano pepper vodka and Mezcal combination when asked to go off menu). The Food: The edibles menu wasn’t expansive, but has a solid sea-and-farm-to-table aesthetic. Since the distillery is so close to the water, the seafood is a good choice – there was a seafood chowder during my visit that was rich with salmon caught just the day before. If you want to go larger, you’ll find an herb-crusted pork loin and troll-caught King salmon, and if you’re looking for lighter fare, the Marina Greens salad is a delight: field greens topped with apple, candied walnuts, pecorino and shaved fennel. Owner and distiller John Lundin told us that the fall food menu comes out October 1, and will be a little more adventurous. Plus, brunch isn’t far behind. The Space: Right on the marina in the Port of Everett, you’ll drive past boats and water vistas on the way in. I suggest, though, a seat where you can both catch the natural views outside and see the lovely copper alembic stills inside. You’ll find lots of tall tables and a few big booths, all constructed by Lundin by hand, made from fir and metal – it’s a rustic industrialism, while being shiny, too (a term used to describe Everett, “sophisticagritty” seems perfect), thanks in part to the bottles of Bluewater vodka and gin sparkling behind the bar. The bar/restaurant is on one side, while an event space/production space is on the opposite, and in total it can host up to 100 people for events.